Autogeek's Roadshow Detailing Classes - New Dates and Locations Scheduled! Home > Car Care Products > Auto Detailing Facts, Tips & Tricks > Detailing Classes > Autogeek's Roadshow Detailing Classes - New Dates and Locations Scheduled! Stay tuned as we continue to add more Autogeek Roadshow classes and dates! Be sure to check back and see what's coming! In the pursuit of spreading valuable detailing knowledge and providing as many people as possible with detailing practice on actual cars, we have started the Autogeek’s Roadshow Detailing Classes! That’s right, we are bringing all of Mike Phillips’ plentiful detailing know-how and on your feet, hands-on training to a location near you! But, Mike Phillips and the Autogeek team are bringing more than just a vast amount of knowledge and expertise. We are also bringing with us an arsenal of detailing tools, products, and supplies that you will be using with your own two hands! We want to make it as easy as possible for you to hone your passion for detailing into more than just a hobby. The only way to do that is to learn, practice, and experience everything it means to detail at a professional level. Now, with the Autogeek Roadshow Detailing Classes, you will get the opportunity to get all of that and more through hands-on training, all without leaving your hometown! While there is no class in the world that can compare to Mike Phillips' Detailing Boot Camp, the Autogeek's Roadshow Detailing Classes with Mike Phillips comes close! 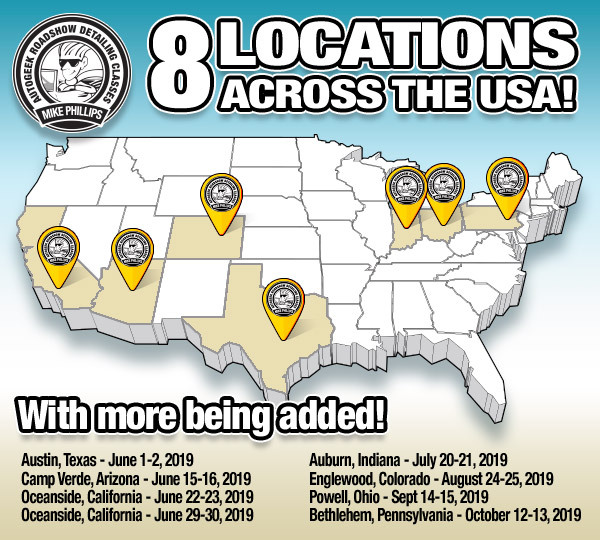 You'll be able to study with the master detailer himself and learn the tricks of the trade through actual practice and hands-on training - all in a location near you! Do your car, your customers, and yourself a favor! Sign up today! Plus, if you sign up 30 days before the class starts, you'll receive a $100 store credit that you can use on products to put all that newly-acquired detailing knowledge to good use! Scroll down to see everything this class has in store! Extreme Washing - This class session covers all the correct tools, products and techniques to thoroughly clean and prep a car for detailing when using a source of running water. Also covered in the morning washing session are the non-washing procedures to do and the correct order in which to do them. This class session covers all the professional techniques to correctly compound and polish paint to perfection. Multiple-step paint correction is called, show car detailing because you're breaking the paint polishing process down into isolated and dedicated steps to maximize the end-results for a true show car quality finish. • How to seal the paint using a ceramic coating, carnauba wax or synthetic sealant, even the cheater technique of using an AIO. • Finishing steps - the final touches.